Sunday October 13 1907 Will and I took a ride over to Art Jones in the forenoon when we got home went on up on the pasture to look at the stock. I got us some dinner and before my work was done Ott Fannie Mother & Hattie came out after they had gone I was busy till nearly bed time with the work I had neglected in the morning. wrote some in evening Will sold the little mule to Art Jones for $100. Monday October 14 1907 Will took the little mule over to Art Jones. I finished a waist I was making for Lizzie Lindley and took it down town in afternoon to mail. I went to see about a hat I came home at 3.20. Will had jist got home. Billy has cut down some more trees in the front yard. I was busy all evening. 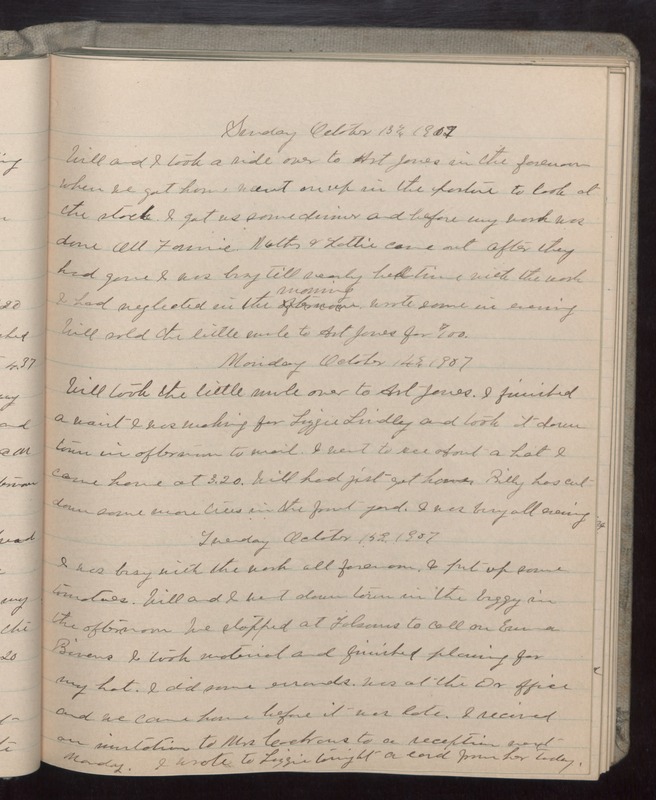 Tuesday October 15 1907 I was busy with the work all forenoon. I put up some tomatoes. Will and I went down town in the buggy in the afternoon We stopped at Folsoms to call on Emma Bivens I took material and finished [planing?] for my hat. I did some errands. was at the Dr office and we came home before it was late. I received an invitation to Mrs Cockrans to a reception next Monday. I wrote to Lizzie tonight a card from her today.